In a previous post I posed the possibility that there was missing step in the migration of Companyweb from SBS 2003 to SBS 2008. After repeating the process again it appears that it does work as laid out in the recommended migration process. Interestingly, when I repeated the process using an untouched version of SBS 2003 Companyweb I actually received a timeout during the Application creation stage. After running the process again it worked as expect. Perhaps when I did my initial migration there was also some sort of timeout that I wasn’t aware of and the site creation failed to complete properly. Maybe, it had something to do with the fact that I used a demo SBS 2003 Companyweb I have. Maybe, there were some security issues I over looked on the SBS 2003 Companyweb that caused the failure of the site creation. Maybe, maybe, maybe. Yes, maybe but looks like I stuffed up (again) and the recommended migration process works as expected. Now I just have to work out what I did wrong. So there you have it. Actually, I commend that you take the time (don’t multi-task) and read the complete article, which simply shows how humans can’t improve their productivity by multi-tasking. In fact they make it infinitely worse. To me the rest of the world seems to be chanting “multi-task, multi-task” but the real heroes are those that step back and say “No, I need to concentrate on one thing at a time”. They may suffer ridicule but I bet they get more done than most people. Have you ever stopped to evaluate your own productivity in relation to things like emails and mobile phones? Are you actually “using” the technology or is “using” you? Technology should be making your life EASIER not HARDER. If it isn’t then perhaps it’s time to take control back or perhaps just ignore it for a while? When you come to Sharepoint from a files and folders background you tend to simply replicate the same structure within Sharepoint document libraries. In many cases this is probably not your best option. Case in point. My external Sharepoint site Supportweb has a Document Library called Documents. In here you’ll find all sorts of documents I’ve created and uploaded. Many are available for free but there is also a whole swag that are only available to subscribers. Initially, when I started uploading to the document library I created a whole lot of sub-folders and placed the relevant documents in these folders. For example, I had folders for Exchange, SBS and so on. Now the problem was when I wanted to find a document that was about Exchange server on SBS. Was it in the Exchange Folder or the SBS folder? Also, people more versed in Sharepoint than me suggest that the best idea with document libraries is to dump everything into a single location (no sub-folders) and then use Sharepoint’s in built filtering capability to find what you are looking for. Now this made a lot of sense to me so I was considering relocating all my documents from their sub-folders to the top level folder. This wasn’t going to be an easy task and may have involved re-assigning the rights to each document again. BUT I found a better way! I simply created a new Sharepoint view called Complete that displayed all the files, even those from sub-folders in a single page! I then made that view the default view so it is what you see when you first enter the document library now. The original All documents view is still there (simply change the view name in the top right of the Documents library and change the view to All documents to see how it used to be). How easy was that? Geeze, I love Sharepoint. No re-keying, moving files and so on. Simply create a new view of your data. I added an additional column to the entries so that the documents can easily be sorted by using Sharepoint (just click on the column heading to bring up the filtering options for that column). Even updating the records was a piece of cake. I simply changed the view to Datasheet view (like Excel) changed the records for that column and returned to the Standard view. Geeze, I love Sharepoint! So image a Sharepoint document library like a phone book, full of data. If you create a view of this phone book (say just family and friends) everything except the records matching your criteria are not displayed. The records are still there in the phone book but you don’t need to see them. Now image you create another view for all your business contacts. You can easily swap between views to display exactly what you need without the need to see irrelevant data. Bottom line is that phone book data is always there. Whenever you update or change something, the record in the phone book also gets changed. One set of data but many ways to view the data. You can even have different views for different people, but the underlying data remains the same. So if you are thinking about creating folders underneath a document library don’t bother, just dump all the data into the one location and use filtering to find what you want. If you already have a document library that is full of sub-folders, create a new that allows you to view all the files together without sub-folders. Again, same data, different view. For documentation of how to migrate Companyweb on SBS 2008 please see the following link. This is constantly being updated from the documentation team so that should always be your first referral for information now and in the future. Don’t forget our Windows Sharepoint Operations Guide (http://wssops.saturnalliance.com.au) for information about installing, migrating and maintaining Sharepoint on SBS 2003. I’ve been working through the suggested Microsoft Companyweb migration from SBS 2003 to SBS 2008 and I think that a step has been overlooked. 15. The Operation in Progress page is displayed. This operation takes approximately 30 minutes. The new Windows SharePoint Services Web application is created, and the Windows SharePoint Services 2.0 CompanyWeb database is upgraded to Windows SharePoint Services 3.0. 16. The Application Created page is displayed. 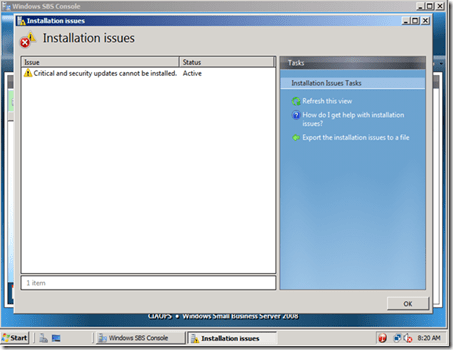 It notes that you need to reset IIS to finish creating the new Web site. You will do this in a later procedure. Close Central Administration for Windows SharePoint Services 3.0. Problem as I see is that you need to create a Site Collection by returning to the Application Management tab and selecting the option Create Site Collection (or click on the link in displayed in page above). If you don’t do this then companywebold is not created as a site and you’ll never see if you try and type into the browser. All that I see is missing that you need to Create a Site collection, call it companywebold, select a Team site template and you’re done. 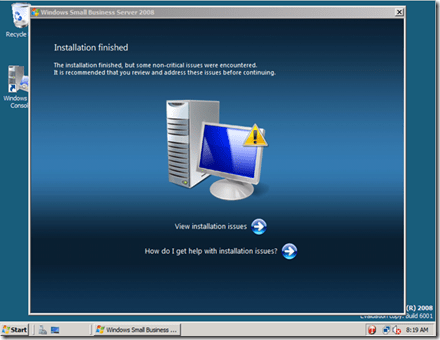 You now have a working Windows SharePoint Services 3.0 Web site that is named OldCompanyWeb and that contains the structure and documents of your old Windows SBS 2003 CompanyWeb Web site. From what I see, that won’t be the case unless you insert the additional step to create a top-level site. I have been testing the SBS 2008 migration process but initially struck some issues during the process. After repeating the process and getting the same results my guess was that it was something to do with ISA 2004 on the source SBS 2003 since I was attempting to migrate SBS 2003 Premium. Don’t ask me why but I reckon that’s what it is. To remove ISA 2004 out of the loop I decided to attempt the same migration but this time from SBS 2003 Standard. I’ve got to say that it has gone flawlessly. because I was running this on an isolated network on under Hyper V it simply meant that SBS 2008 couldn’t get to the Internet to get some updates. Not a big issue. As I said before, the whole process so far of attaching the new server to the domain is a snap since it picks up everything from the answer file you create prior to the migration. There is still a little more to do to complete the migration but I am extremely confident that too will be a snap. I’m documenting Microsoft’s suggested method of companyweb migration after which I’ll also be developing what I reckon is a quick method. Here’s a video to show you how straight forward the installation of SBS 2008 RC0 is. After just a few click you should have a system up and running. <img src="http://lh6.ggpht.com/–F1aSzhQwmU/UQ8NO44P7FI/AAAAAAAAIO0/5lKKyyV3vaY/video9fb14216e3c6%25255B5%25255D.jpg?imgmax=800" style="border-style: none" galleryimg="no" onload="var downlevelDiv = document.getElementById('66c88d68-f8cd-4ccb-8af6-f39588d31f74'); downlevelDiv.innerHTML = "
As usual, don’t forget all our other videos at http://www.youtube.com/saturnalliance.